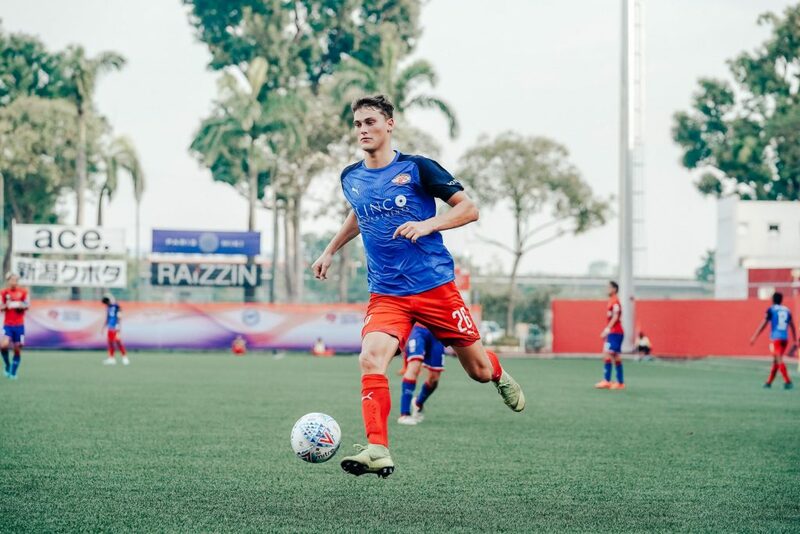 SINGAPORE, 3 APRIL 2019 – As far as professional debuts go, Oliver Puflett’s could not have been better. Thrust into Home United’s starting line-up against Warriors FC last Saturday, the attacker produced an exquisite lobbed finish in the closing stages to round off an emphatic 3-0 win in the Uniformed Derby. 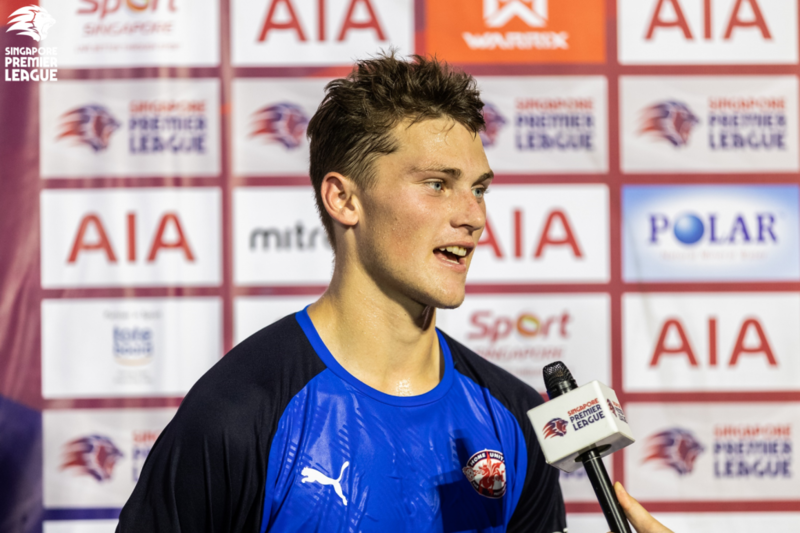 The way Puflett took his goal oozed class and composure, marking his arrival to the Singapore Premier League (SPL) in style. “I was positioned on Warriors’ right centre-back at that time when we had possession,” the 19-year-old told the official SPL website. “The ball came to Izzdin (Shafiq), who knows how to play the killer pass and I knew that. “We made eye contact as the ball travelled to him and it was then that I peeled off the centre-back and made an arced run to get an advantage over the central defenders. Izzdin’s ball was perfect, allowing me to reach the ball with enough time to see the goalkeeper coming out. From there, instinct took over. Earlier in the second half, the 1.87m forward had already made a key contribution with his teasing left-wing cross, which led to Hami Syahin’s opening goal for the Protectors. The Australian Under-19 international aims to build on the match-winning performance and make his mark in Singapore, having arrived from the youth setup of A-League side Western Sydney Wanderers. “The offer from Home came to me by my previous coach Arthur Diles, who recommended me to an agent who was looking for an U23 striker, who’s tall and fast,” he said. “The agent spoke about this opportunity to come to Home United, so I decided to come here on a one-week trial to see and get a feel of Singapore football and the culture. Puflett’s contributions helped to ease the pressure on his new employers as they finally notched their first win in 90 minutes after seven fruitless attempts in all competitions in 2019, leaving coach Saswadimata Dasuki a happy man. “Of course I’m delighted for the boys – we’ve been working hard for these first three points,” said the 49-year-old, who took over Aidil Sharin at the end of last season. “Oliver only trained with us for one week, but I needed him to start because we need somebody upfront to make the runs behind the defenders. It was a bittersweet victory for the Protectors. Veteran attacker Shahril Ishak suffered a complete tear of the anterior talofibular ligament (ATFL) of his left ankle and will be ruled out for approximately six weeks. But influential South Korean forward Song Uiyoung returned from a six-match absence to smash in the second goal three minutes after coming off the bench, becoming available just in time for a upcoming schedule of six games in 25 days. “I really missed working hard for the team on the field,” the 25-year-old said. “I got a good cross to me straight after coming on and I knew I could take the chance confidently, because I’ve practised on scoring since I returned to training last Tuesday. Things are finally looking up for Home after a poor start to the season, with successive wins in the SPL and AFC Cup. Furthermore, since conceding five apiece against Tampines Rovers and Kaya FC, they have now kept three clean sheets in a row. It is a streak that Saswa hopes to continue as they look to reignite their SPL title charge. The Protectors are now fifth with four points from as many outings – six behind early leaders Tampines. “It (keeping clean sheets) is very important,” he said. “Football is a team game – everyone must work hard when we don’t have the ball and defend our goal. At the other end, he can rely on his new recruit, who wants to score more than 10 goals and the Young Player of the Year accolade. “As a young player, you always have to set yourself goals to see where you can progress in your career,” he said. “I’ve come here full of confidence and energy, ready to make my mark on the SPL. Meanwhile for Warriors, defeat in each of their first two games has left them bottom of the standings, but Emmeric Ong believes they will get out of the slump soon enough. “We actually had a decent first half (against Home) and should have taken a single-goal lead, which could have made for a very different second half,” said the defender, now into his fifth season at the club.